When you call a plumber, you expect a quick response. You want quality work delivered with integrity. John’s Plumbing & Pumps, Inc has developed a strong reputation for providing quality workmanship at a fair price, throughout our many years of service. We understand that our success depends on your satisfaction, and we approach every job, big or small, as if our continued success depends on it. To us, it does. That is how we have gained a reputation as your go-to plumber in Thurston County and have continued to thrive for over 50 years! We understand it can be difficult to select the right plumber when there are so many in Thurston County. Beyond having more than 50 years in service, we also maintain an A+ rating with the BBB. We keep our costs down and often match or come in lower than the estimates of other plumbers. Those are just some of the ways we excel. Our plumbers in Thurston County are each hand-selected for their experience and know-how. They are able to work on any type of repair, construction, or other projects you have. They are also friendly and deliver excellent customer care. After our initial inspection, we take the time to explain what we find and make sure you understand the situation and our suggestions for repair or other services. We never do any work without your go ahead. We also deliver transparent, straightforward written estimates—no hidden fees with us! Each plumber working for us goes through continuing education to stay current on the latest updates to building codes, products, and manufacturers’ guidelines. Your plumber will be able to install the latest tankless water heater or use our high-tech equipment to find an underground leak, and much, much more. Our plumber in Thurston County comes to you quickly and ready to repair or replace just about anything. We drive well-stocked vehicles to avoid waiting for parts. Our technicians have the skills to work on commercial or residential plumbing of any kind. We get to you fast and are ready to work. When it comes to a leak, we understand that waiting can amount to more damage. That is why every minute counts. We use top-quality products and stand by our work with guarantees you can rely on. We test the work we do and won’t call it a day until we are certain everything is working as it should. 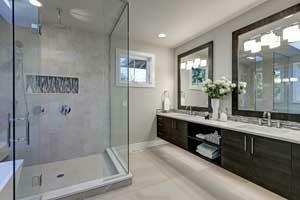 Our plumber in Thurston County delivers stellar craftsmanship every time. Contact us today for a plumber in Thurston county you can count on for reliable service you can afford.